Addicted to podcasts? Ever considered starting your own? We’ve got podcast recommendations — as well as tips and insights from some of Texas’ leading podcast experts. 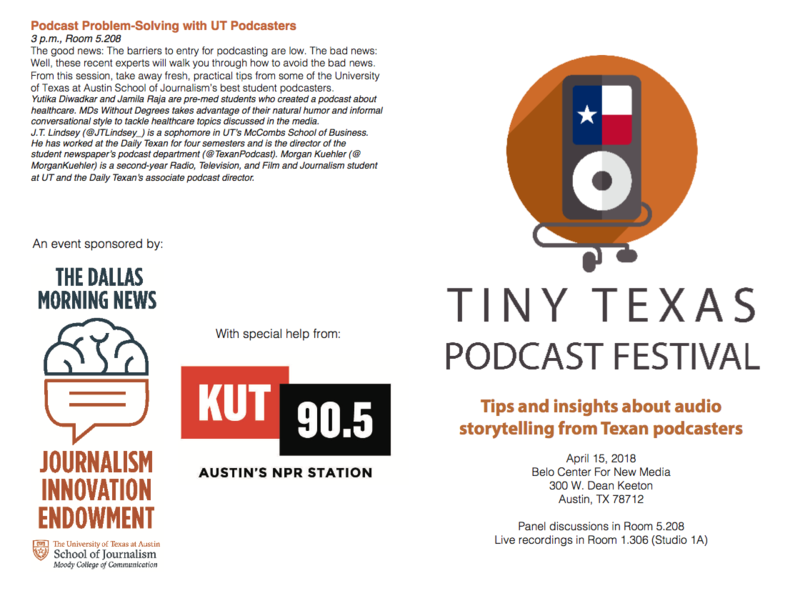 The Tiny Texas Podcast Festival invites audio storytelling fans of all kinds — from occasional downloaders to super listeners who can’t stop clicking “subscribe” — to spend a day at the University of Texas at Austin School of Journalism listening to and learning about podcasts. The mini fest celebrates all facets of podcasting through a series of five professional-led discussions and three live podcast recordings. Sponsored by the Dallas Morning News Endowment For Journalism Innovation, the free event takes place on Sunday, April 15, from 10 a.m. to 4 p.m., at UT’s Belo Center For New Media (300 W. Dean Keeton), following the International Symposium on Online Journalism (ISOJ). Anyone is welcome to join, and both experts and new converts are welcome. However, space is limited, so please register as soon as possible to ensure your seat. According to Pew, one-third of Americans have listened to a podcast, and that community has been growing steadily since 2013. Recent developments in podcasting — such as Netflix-style release schedules and cross-platform projects that blend into television and books — are only a few examples of how the story format continues to innovate as it gains fans. These innovations and others will be discussed at the Tiny Texas Podcast Festival, which highlights audio storytelling in Texas, thanks to expert guest speakers throughout the state. Presenters include Dallas Morning News Arts & Culture Editor Christopher Wynn, host of the Strange podcast, who will teach attendees how to tell compelling stories through a serialized audio format, and Monte Williams, producer of Texas Monthly’s National Podcast of Texas, who will walk podcast fans past the genre’s minimal barriers to entry with tips for how to get started on a small budget — and how to expand as you grow. 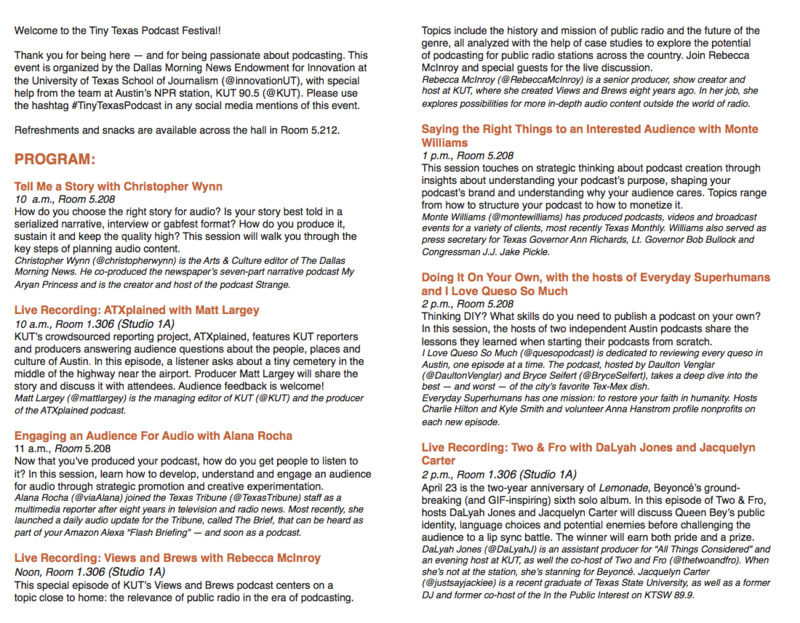 While the event’s five panel discussions guide attendees through serialized storytelling, recording software, audience development and other key topics, podcasting fans will also have the rare opportunity to watch three established Austin podcasts come to life — from mic test to ending sequence — thanks to the award-winning team at Austin’s NPR station, KUT 90.5. DaLyah Jones and Jacquelyn Carter host the program Two and Fro, a podcast dedicated to the identities and experiences of Black southern women. Their live recording at the Tiny Texas Podcast Festival will celebrate the second anniversary of Beyonce’s 2016 groundbreaking and GIF-generating album Lemonade. KUT executive producer Rebecca McInroy will also bring her podcast Views and Brews — normally recorded live at Cactus Café — to the Tiny Texas Podcasting Festival for a special recording. And KUT Managing Editor Matt Largey will record an episode of the station’s popular crowdsourced podcast, ATXplains, in which Austinites ask KUT’s journalists to answer burning curiosity questions about their hometown. The event is free and open to the public, so all fans of podcasts, audio storytelling and innovation in journalism are welcome to attend. Coffee, tea and snacks will be provided. All guests are asked to please register for the event in advance online for planning purposes. This is the second public event hosted by the Dallas Morning News Journalism Innovation Endowment. The $1.5 million gift, given to the School of Journalism by the Belo Foundation of Dallas in October 2015, is dedicated to exploring the future of journalism and supporting the School’s innovative courses, research and projects. In 2017, the Dallas Morning News Journalism Innovation Endowment partnered with the Knight Center for Journalism in the Americas and the International Women’s Media Foundation to bring together leading female journalists from Texas and Mexico to discuss issues faced on both sides of the border.